Problem: You don’t know how much of your electric bicycle’s performance you can use before its battery runs out. Solution: The new Specialized Turbo S let’s you program ride distance, time and how much charge you want to use, then maximizes electric assist to suit. Electric bicycle work by augmenting the power you apply to the pedals making the ride both easier on your legs and faster than you could likely achieve on your own. Commute up hill to work? You won’t need to break a sweat. 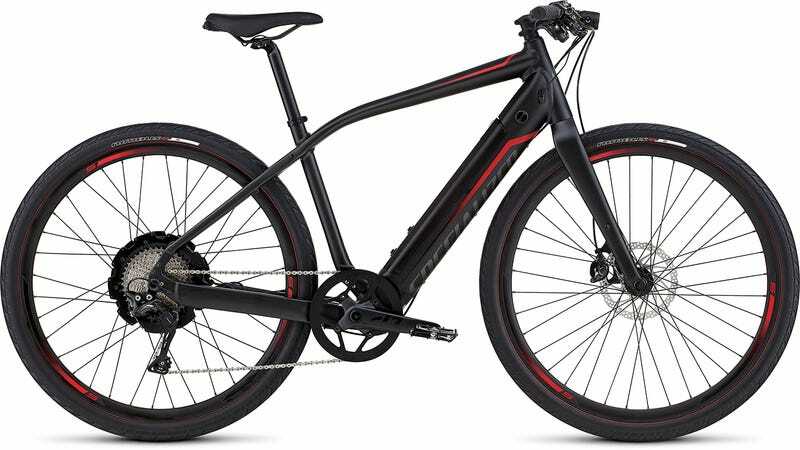 And, for the last few years, the Specialized Turbo series has been the first quality electric bicycle widely available from a mainstream manufacturer. It’s fast, efficient and comfortable, making it ideal for urban riding. For 2016, they’ve upped the top speed from 26 to 27.9mph thanks to a more powerful motor and upped battery capacity across the S, E and X models. Subtle designations, right? Specialized is dedicated to getting commuters out of their cars and onto e-bikes instead and is really pushing them as objects of desire. The Turbo X is fitted with front suspension and a suspension seat post for a less performance-oriented, more comfortable ride. The S is fitted with a 500 Watt motor and a 691 Wh battery, good for a range of 35 to 60 miles, depending on how you ride. A high quality urban bike fitted with quality components, it retails for $7,000. The cheaper, The $4,500 Turbo X is fitted with a 250 Watt motor and and 562 Wh motor, while the $3,000 Turbo E has a 200 Watt motor and 468 Wh battery. The biggest change, however, is going to be the new Mission Control app, which connects to the bike via Bluetooth and allows you to pre-program the distance and duration of rides, along with how much battery capacity you’d like to remain at the end. So, for your normal two-way commute, you can maximize performance, while ensuring you have enough battery to make it back home for an overnight charge. Or, for your weekend Central Park loop, you can make sure the bike will get you home, while still powering up the Williamsburg bridge on the way. Through the app, you can also monitor your charge remaining, track distance covered, and dial-in desired performance and assist levels, independent of the range calculation described above. So more control over your electric bicycle’s battery and motor, basically, with some aids to help you with your range anxiety issues. We’ll be testing the new Turbo in the real world starting next week.